TED talks are often good examples of the use of graphics and visualization to convey concepts and engage the public. I believe Hans Roseling always gives remarkable and fascinating talks thanks to the passion he puts in the story telling and -of course- to the great graphics! He shows complex historical data with gapminder, a non-profit web service displaying time series of development statistics, that makes all the data look very clear and even fun! He provides several eyes opening talks, and another of my favorites is on Asia’s rise, where he projects the precise date India and China will reach the wealth level of U.K. and U.S. Yesterday Yingqin Zhong, a PhD candidate at the National University of Singapore, gave a very fascinating talk (IS seminars, School of Computing) on the use of ICT for student-centric education. She provided both a theoretical framework and real life examples of how technology can support better learning. 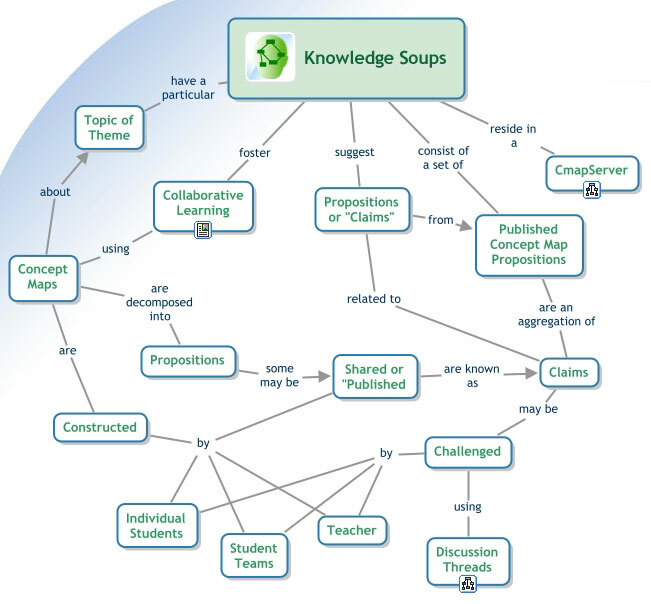 Among the several tools and techniques, including wikis and facebook, she illustrated how knowledge visualization – as mind maps and concept maps- are useful for learning by reflecting and articulating our thoughts. And they also serve as learning resources for others. I am glad to see that representations are gaining their place as powerful learning and knowledge sharing tools also in Asia! Yingqin choice of mind map and concept map (as the one in the figure) made me think that indeed these two knowledge representations techniques should be particularly suitable in East Asia, because they emphasize relationships among the elements and are provided in a non-linear structure. She also presented Second Life as a suitable tool for learning by doing and by collaborating. The issue here is how to exploit the benefit or virtual worlds for education, and not just replicating real life or a chat. This seems a very promising area of research. Finally she shared a hearth touching story of how an indian girl saved her family’s farm and all the village by identifying through the internet the insect specie responsible for the problems at the farm and the right insecticide! These days I am conducting an experiment in Singapore to test if there are cross-cultural differences in the reception of various kinds of business visualizations, between Europe and Asia. Despite the general belief that visualization is an international language, recent research (see The Geography of Thought by Nisbett) has demonstrated that there are relevant differences in the reception of images, between East Asia and Western countries. You are currently browsing the Sabrina Bresciani blog archives for November, 2009.